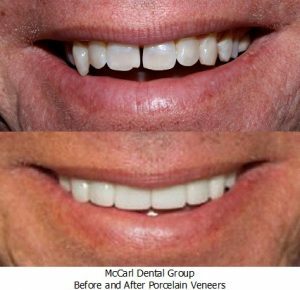 Veneers are crafted from the most durable, natural looking dental porcelain, and they are customized to blend seamlessly into a patient’s natural smile line. The process is simple and comfortable for the dental patient. 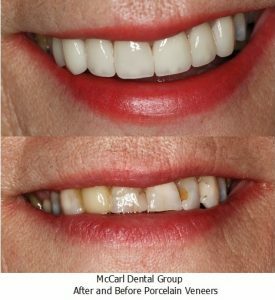 When needed, a small amount of surface enamel is removed to prepare teeth and allow the veneer to lay flat within the line of the smile. Then, impressions are taken. These bite impressions show the tooth’s shape, grooves, pits, and other factors that are used by our lab to design a custom porcelain veneer. 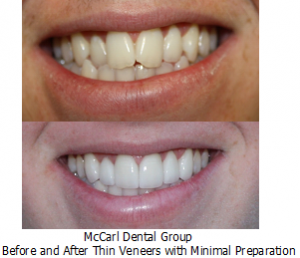 Before patients leave our dental office, we may place a temporary veneer. These temporaries are made from a less durable material, but it protects prepared teeth and allows patients to get used to the look and feel of their veneers. 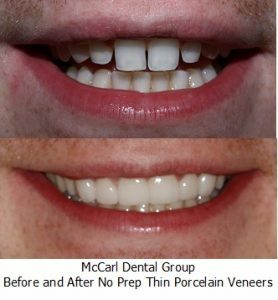 Once we receive the finished product from our lab, patients return to exchange the temporary for a custom porcelain veneer. Once in place, patients can enjoy their flawless smiles for years. With proper care at home and regular office visits, veneers can last ten, fifteen or many more years. In most cases, patients don’t need to make any dramatic changes to their at-home hygiene routines. We may recommend changing toothpastes and other hygiene products to ensure patients are using the least abrasive options to limit wear. These cosmetic restorations are durable, stain resistant, and even with years of wear, they retain their completely natural appearance. No treatment is right for every patient. If you have a number of cosmetic flaws on those teeth that are visible when you smile, porcelain veneers may be right for you.